Are we safe in Costa Rica? 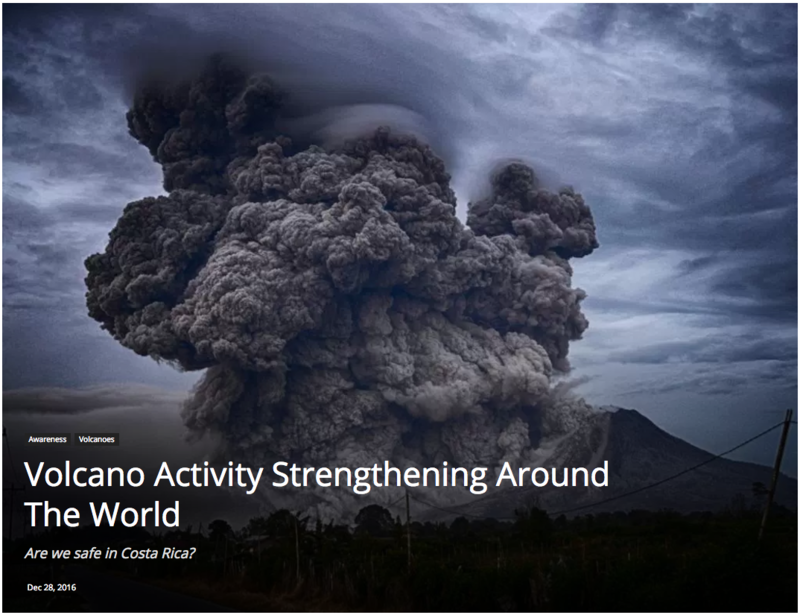 Volcanoes Campi Flegrei in Italy, Sakurajima in Japan, Pavlof in Alaska, Popocatépetl in Mexico and Iturrialba in Costa Rica among others showed signs of reawakening in the last semester of 2016, sounding the alarm among the scientist community that warns about a chain of imminent eruptions. Throughout history, volcanoes have inspired fear and admiration as well. Vesubio (Italy), Mount Tambora (Indonesia), Laki (Iceland), Mount St. Hellen (USA) and Nevado del Ruiz (Colombia) are just some of the volcanoes that have ravaged entire populations in different periods of time, killing thousands of people and turning vast areas into a desert of fire, ashes and sulfuric gases. But, strange as it may sound, volcano activity has become an item of the so-called eco/adventure tourism, thanks to the unmatched, unique spectacle of lights and sound that offers a moderated eruption. According to experts, it takes 500 years for a supervolcano to reawaken, even less. And this seems to be the case of Campli Flegrei in the west of Naples, Italy, an extensive volcanic that boasts 24 craters and its cauldron-like depression was formed 39,000 years before as part of the biggest eruption that Europe has experienced in the last 200,000 years. A team of researchers led by volcanologist Giovanni Chiodini from the Italian National Institute of Geophysics in Rome assures that Campi Flegrei seems to be approaching a critical pressure point, a sign that could be read as announcing of an imminent eruption. The research team says that Campi Flegrai has registered an “uplift” since the last decade, what it means that the volatile gasses inside are rising to the surface at an unexpected rate, turning the alert level from green (or quiet) to yellow (or monitoring mode). Another colossus, Sakurajima volcano at Japan’s Kyushu island, had a ‘bad awakening’ last April 29thafter that two earthquakes shook that Asian country, daily Asahi said. Again, a team of experts considered Sakurajima could be close to a major eruption since it is being supplied with around 14 million cubic meters of magma each year, a growing potential to trigger an eruption within 30 years –or much less. Sakurajima volcano’s last deadly eruption occurred in 1914 with a toll of 58 dead, gaining the infamous nickname of the Naples of the Eastern World. The American continent doesn’t escape from this latent risk. Consider Pavlof volcano in Aleutian islands, Alaska, that erupted last March 28th. Since its burst, police, and geological service has kept the alert about “risk of air and land pollution”. Recently, a new eruption sent ash and steam 34,000 feet into the air causing no injuries nor damages. Similar moments of fear and confusion lived people of Puebla, Mexico, when the giant of fire Popocatepetl awoke with a concert of explosions and fume columns, daily El País reported in its March 19th edition. Last new of its activity was made last December 1st when Puebla’s International Airport was reopened after being closed due to falling ash from the volcano. Mexico’s National Center for Disaster Prevention informed that Popocatepetl has been sending water gasses, ash and lava fragments since last March. Popocatepetl is one of the most dangerous volcanoes in the world since a population of 25 million people living around. Costa Rica, land of well-reputed volcanoes that attract thousands of visitors each year, is not novelty the news about fumes columns, ash rain or eviction alerts. Nevertheless, Turrialba, the biggest of its volcanoes, started to spew smoke and ash 9,840 feet into the sky last May 21st, causing breathing difficulties to hundreds of people who required medical attention. Since this awakening, Turrialba’s activity hasn´t stopped throughout 2016. In fact, operations of main Costa Rican Airport should be suspended on September 21st after a Turrialba’s eruption sent a thick cloud of ashes and poisonous gasses, urging local residents to wear protective masks in order to undertake their daily tasks. This trend of Turrialba’s sporadic ashes-spewing has kept until December 2016. It is important to remember that Turrialba volcano registered its last ‘big’ eruption in October 29th, 2014, a night to remember for hundreds of local residents who were urged to flee their homes as a security measure after a rain of fume and heavy ashes came out of its crater. According to recent researches, that event would be mainly responsible for a rise in 10 meters of its central crater in the last two years and increased by the eruptive activity between September-November of 2016. Last reports say that Turrialba has kept “a passive but constant activity”, adding that volcanic movement was registered on December 25th. The main answer, though, is what people must do? Should nearby residents from volcanic areas panic? Unfortunately, there is nothing they can do but being alert and attend to the authority’s recommendations. “In general, volcanology is not a precise science. We have many uncertainties and long-term provisions are at the moment not possible! For example, the process that we describe could evolve in both directions: toward pre-eruptive conditions or to the finish of the volcanic unrest, Giovanni Chiodini warns. In this respect Costa Rica boasts a very complete Emergency Plan of Action for Volcanic Eruption, created on March 23th 2015 by International Federation of Red Cross and Red Crescent Societies with the aim of mapping the areas of risk around Turrialba volcano in order to increase the number of response strategies at the moment of an imminent major eruption, as well as to raise awareness among the communities’ members with regards to risks and hazards, acknowledging evacuation routes and encouraging the creation of volunteers’ helping groups.